A little while ago, I got the idea to make a list of my favorite places to eat in Miami. And when I say "a little while ago," turns out it was nearly five years ago. This was pointed out to me recently when Frod Jr. was home on winter break. When he told friends at school that his old dad wrote a food blog, they thought that was kind of cool. Then they went and looked, and of course were drawn to the List, and said, "Well, that's, um, kind of dated." It sure is. Indeed, not only was that list pretty stale, but more than a quarter of the places included have closed since it was prepared – which among other things, may tell you something about the correlation between my personal preferences and restaurant success. (In my defense, that percentage is probably relatively consistent with the general failure rate in the industry, and I didn't prepare the list with predictive value in mind). In any event, it was definitely time for an overhaul. 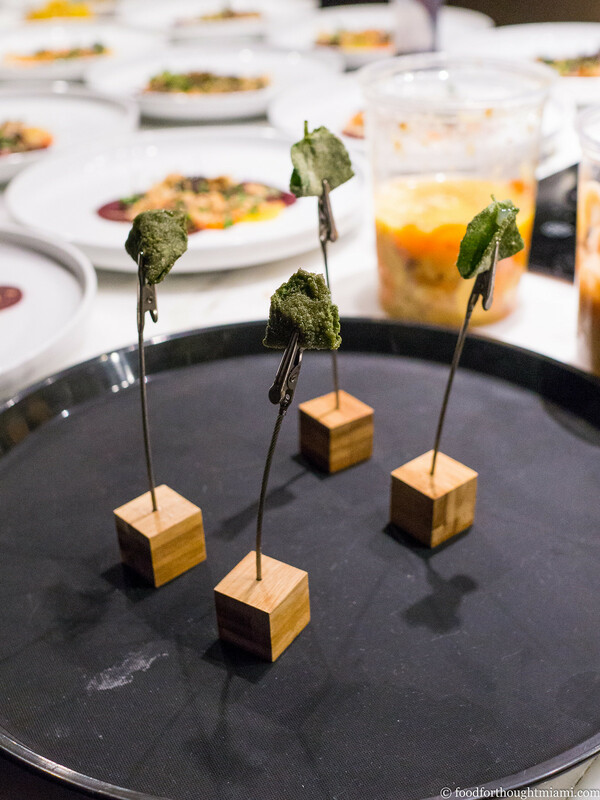 The process was illuminating as to how the Miami restaurant world has changed over the past five years. Of the 38 restaurants that filled out that original list (the current version has been whittled down to 28), only ten remain on the updated version. 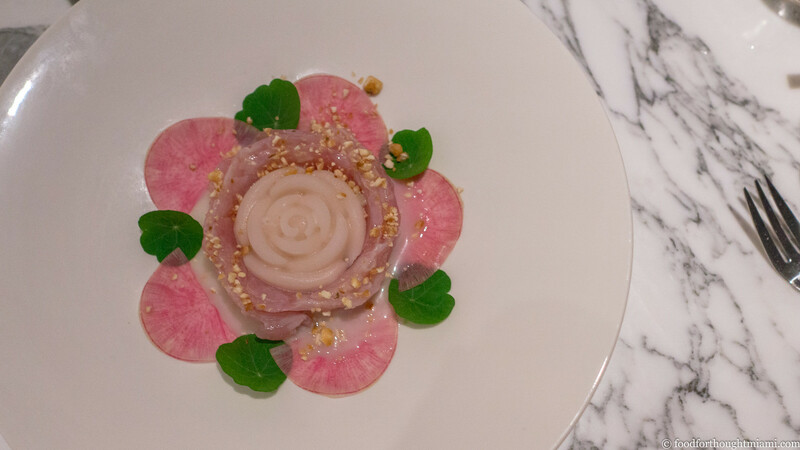 The repeats: Bazaar, Bourbon Steak, Eating House, Hiro's Yakko-San, Joe's Stone Crab, Josh's Deli, Makoto, Michael's Genuine, Naoe, and Pubbelly. Of the many new additions to the list, six are brought to us by out-of-town restaurateurs, what I've sometimes called "invasive exotic species" (Byblos, La Mar, Le Zoo, Los Fuegos, Myumi, Pao). But the bulk of the new names come, in some form or another, from locals, though that term can be amorphous in a community as transient as Miami's. And half of the new names on the list are places that have opened in the past two years. Since I'm generally not one to go chasing the latest shiny objects, that would seem to indicate that good things are happening here. As always, this does not purport in any way to be an objective, authoritative, or encyclopedic survey of Miami dining options. It is undoubtedly shaded by my own personal predilections, and moreover, is admittedly riddled with gaps because of the ever-growing length of my restaurant "to-do" list. So here it is. The List: Where to Eat in Miami, now updated as of January 2017. Let me know what I've missed, and what I've gotten wrong. While I've been in South Florida all my life, I recognize that if you've been in Miami more than two years, you're practically a local. 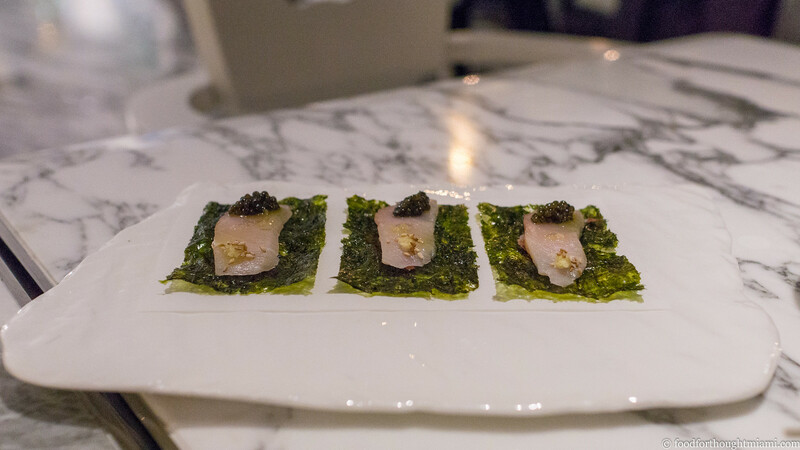 So I think of Kyu as a locally-grown place even though chef Michael Lewis worked all over the world before coming here several years ago to open Zuma. 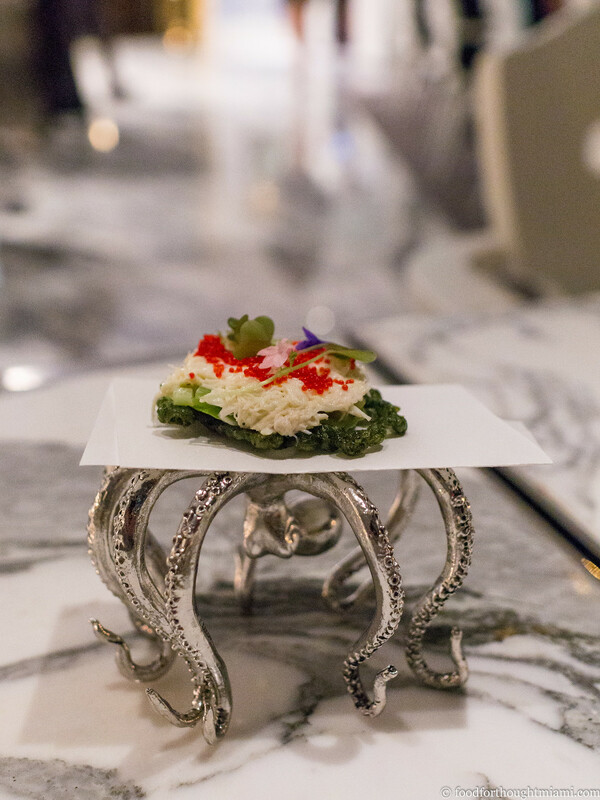 And even though I lump Gaston Acurio's La Mar with the outsiders, its chef de cuisine, Diego Oka, surely has earned his stripes as a Miamian by this point. For years, we were regulars at Hanna's Gourmet Diner, a shiny aluminum-sided diner along Biscayne Boulevard in North Miami Beach. 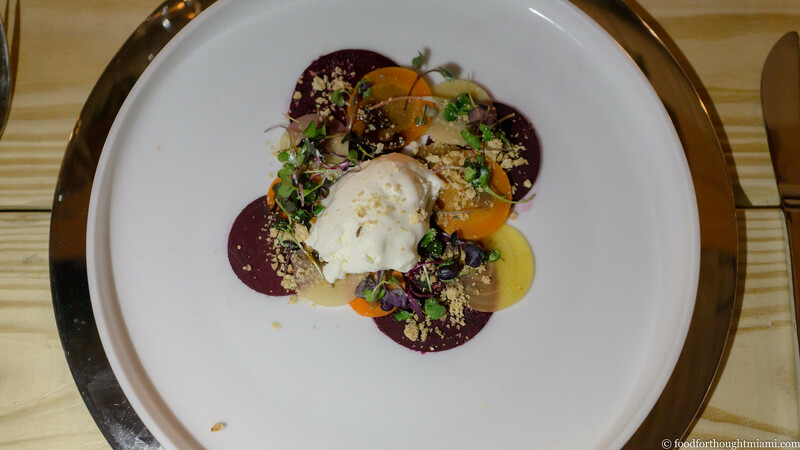 Though it changed hands from the original owners some time in the 90's, Gourmet Diner maintained its quirky mix of retro Americana atmosphere and rustic French cookery. With its casual setting and several kid-friendly items on the menu, it was a place we could comfortably bring the whole family. And while the kids ate penne with pink sauce, I could have celery root salad, French onion soup, trout meuniere, tenderloin tips in bordelaise sauce, or their reliably good roast duck. Always with a side of the vegetable souffle of the day, and sometimes, a fruit tart for dessert. Gourmet Diner moved out of the space a couple years ago. 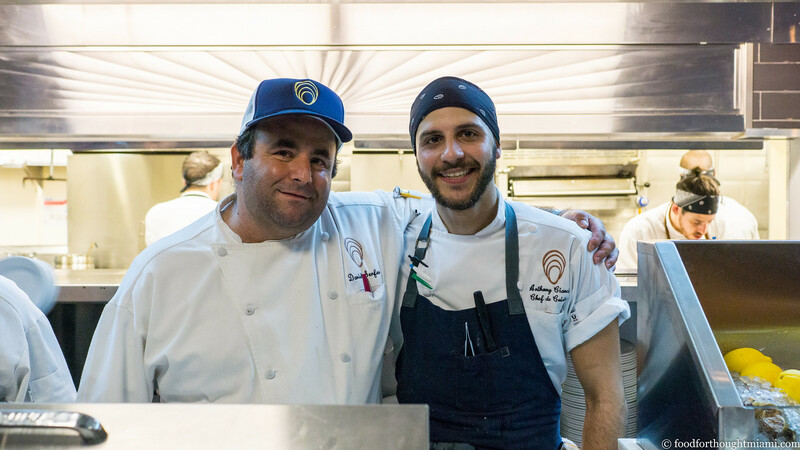 Happily, Daniel Serfer and Ryan Roman, chef-owner and co-owner of Mignonette oyster bar near downtown, spotted it and had a good idea. 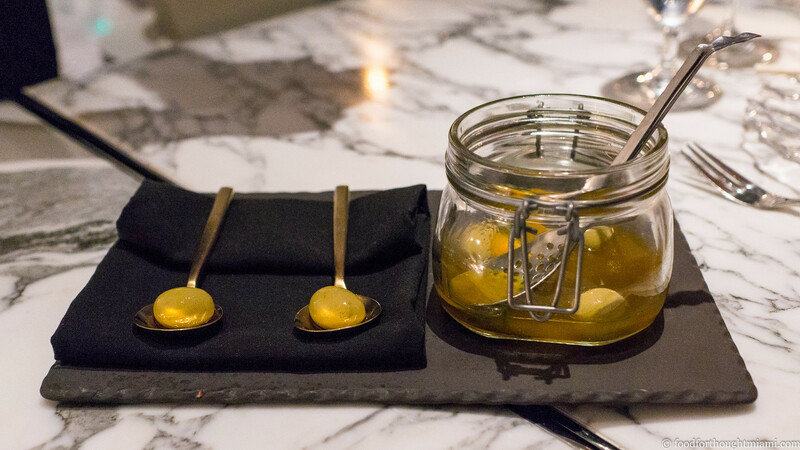 Now, it's Mignonette Uptown. I was there for "friends and family" last Thursday. It was great to see the old diner back in action, and even more so, as a second iteration of one of my favorite Miami restaurants. 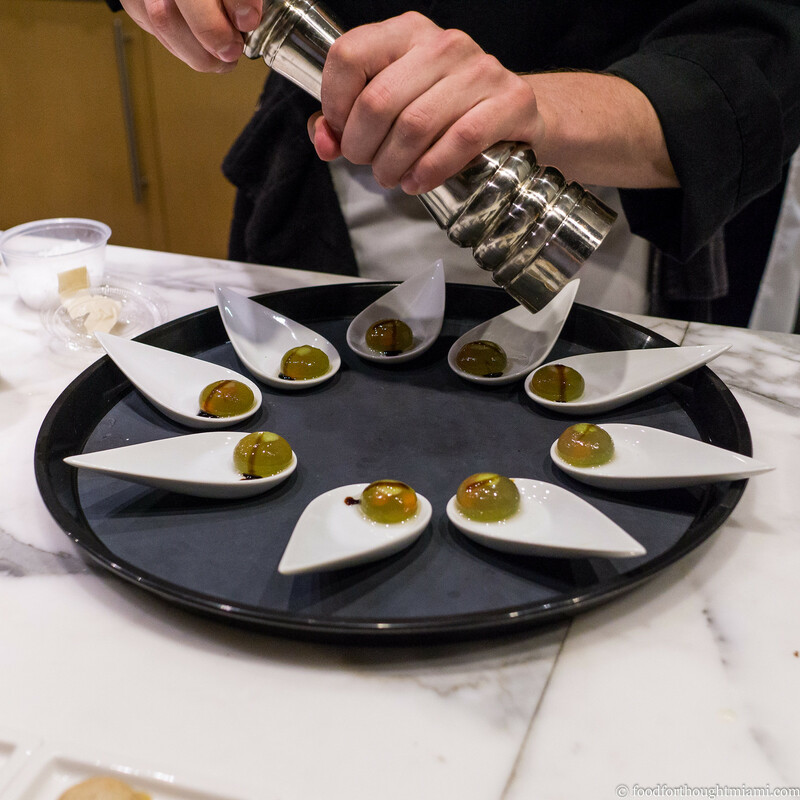 (You can see all my pictures in this Mignonette Uptown flickr set). They kept a lot of the good "old bones" of the place, while still sprucing it up considerably. 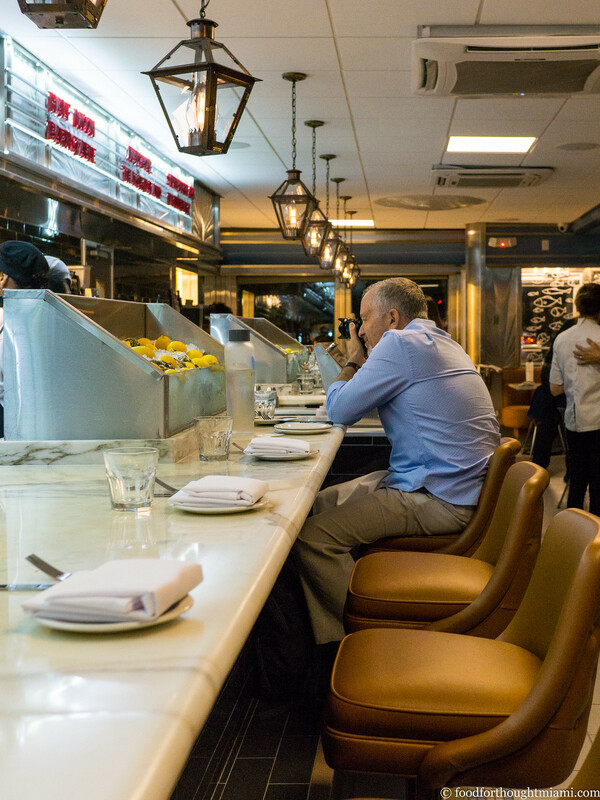 So the long white marble counter in front of the kitchen is still there (a perfect fit for an oyster bar), but there's a movie theater style marquee above it, like in the original Mignonette, displaying the rotating daily selection of oysters. 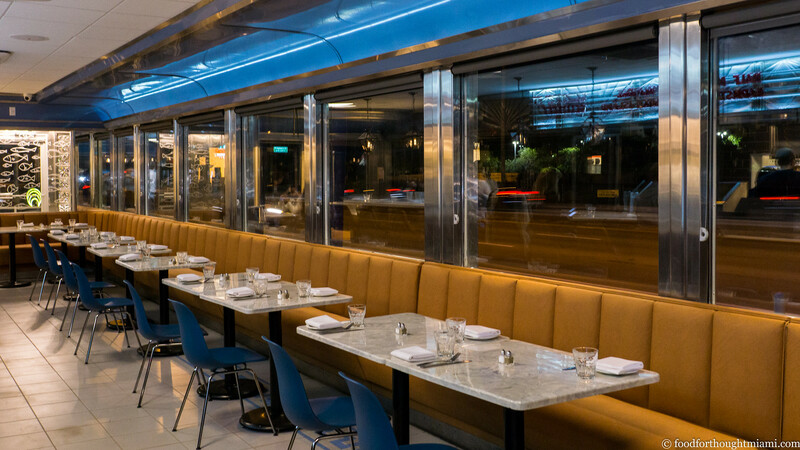 The same old marble tables also line the windows facing Biscayne Boulevard (or maybe they just bought the same exact ones), but a comfortable leather banquette has been added. 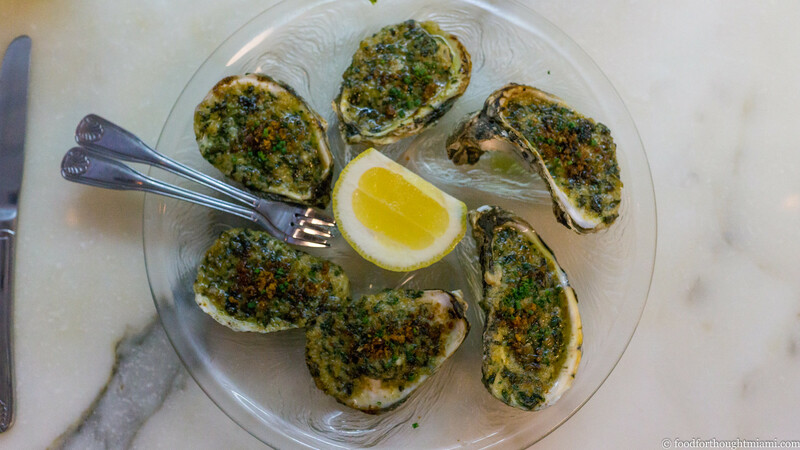 The menu is similar in format to the original Mignonette: there's an assortment of freshly shucked oysters, seafood towers, a CBGB (chowder, bisque or gumbo) of the day, a crudo of the day, and an assortment of mostly fish and seafood dishes, done either "plain" or "fancy." 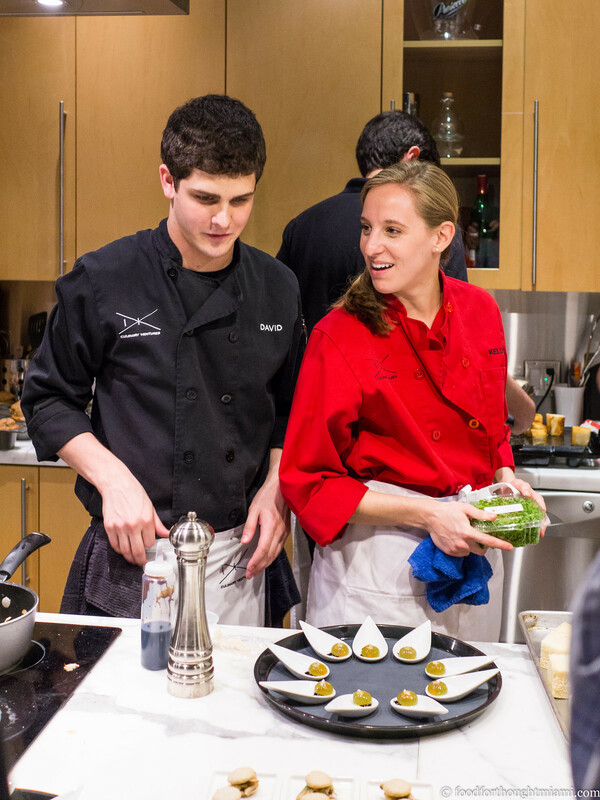 But the details bear the imprint of chef de cuisine Anthony Ciancio, who's done time in some very good places: Michael's Genuine, 27 Restaurant, Alter, as well as Sean Brock's McCrady's in Charleston. 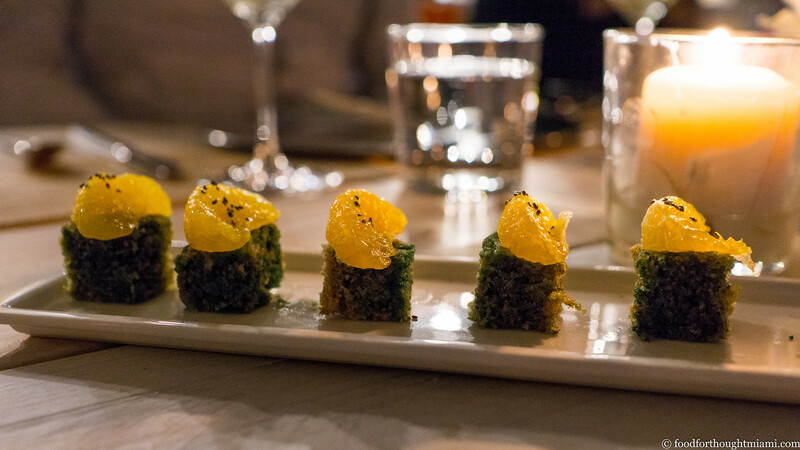 So you can get a classic like Oysters Rockefeller, done with watercress, Pernod and a dusting of parmesan. 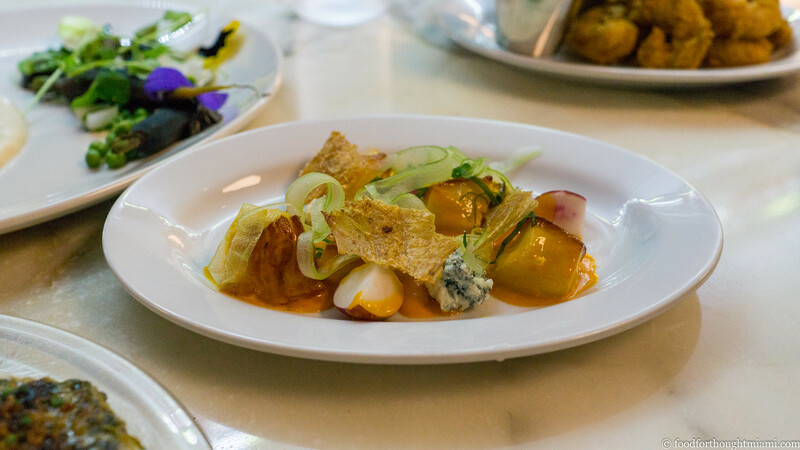 Or you can get Buffalo Scallops, napped in hot sauce butter with crumbled gorgonzola, quartered radishes, ribbons of celery and shards of crispy chicken skin. 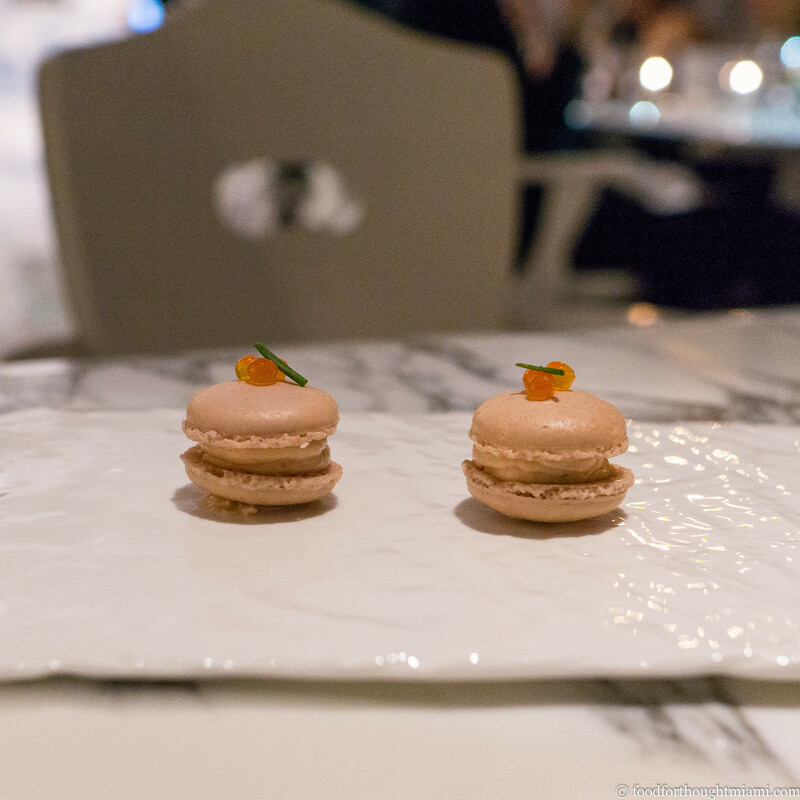 The "fancy" main course options are perhaps even more finessed than those at the downtown location. 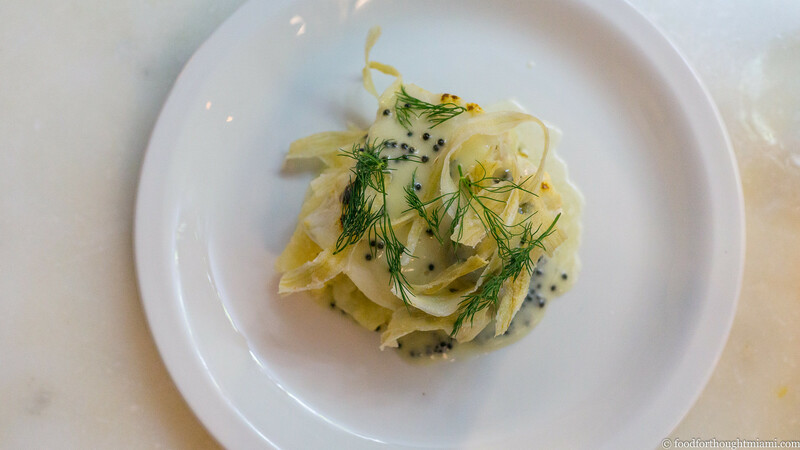 A fat tranche of cod, which flakes into broad, silky ribbons, is served over batons of yuca and napped with a champagne beurre blanc dotted with caviar and then crowned with twirls of fried yuca and wispy dill sprigs. 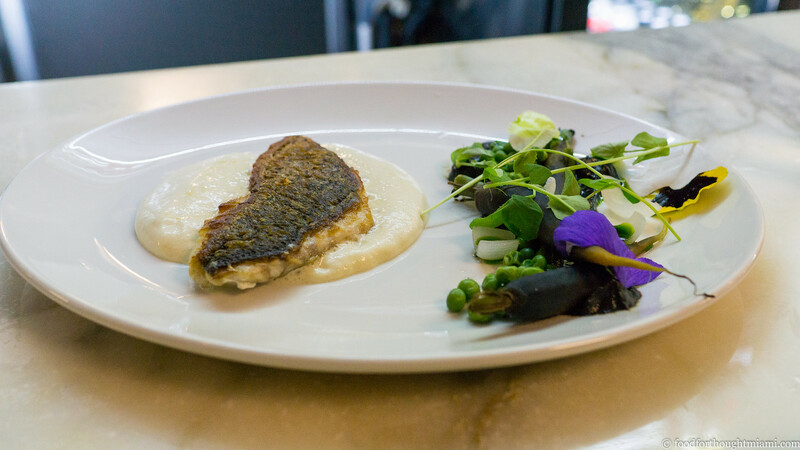 Pan-seared striped bass is served over a creamy onion soubise; its accompaniment, "peas and carrots," sounds pedestrian but surprises with dark purple roots and subtly minted peas nestled over a carrot purée garnished with pea shoots and fancy flowers. 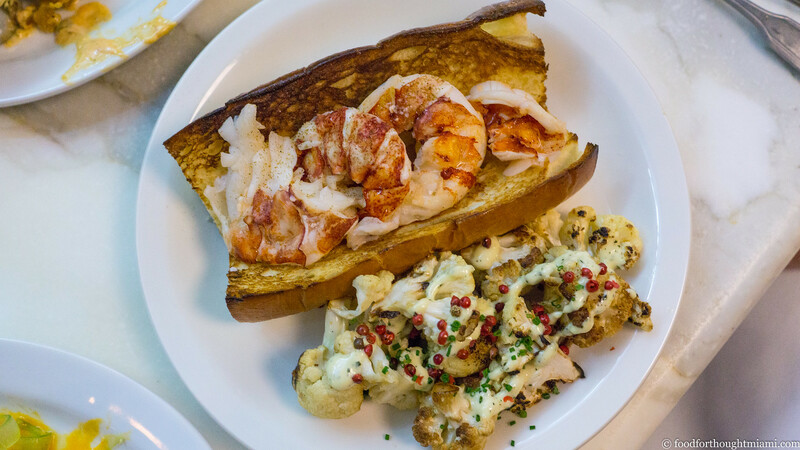 Those with no appetite for such indulgences can get a generously stuffed lobster roll (but where are the knuckles and claws? ), a choice of plain grilled fish, fried chicken, or a dry-aged bone-in NY strip steak. 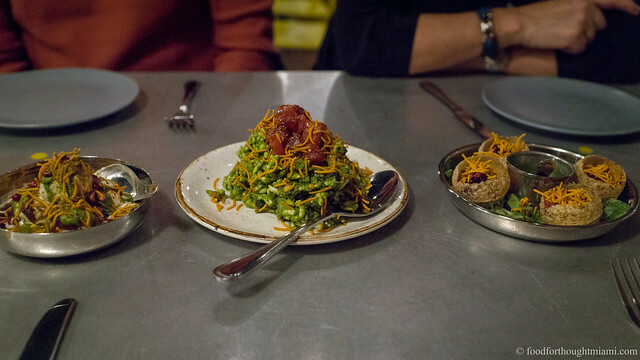 Serfer may be one of the only guys in town with a more finely honed sense of dining nostalgia than myself. 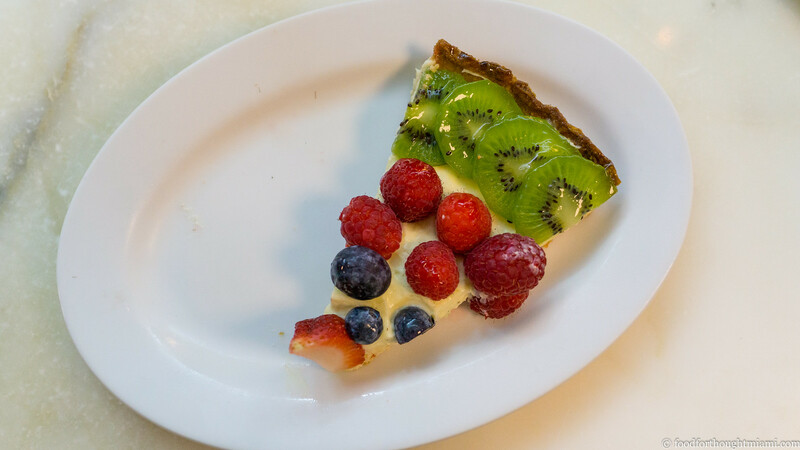 So he got pastry chef Devin Braddock, another MGFD alum who worked with the wonderful Hedy Goldsmith, to create a "GD" fruit tart just like Gourmet Diner used to serve, only better. 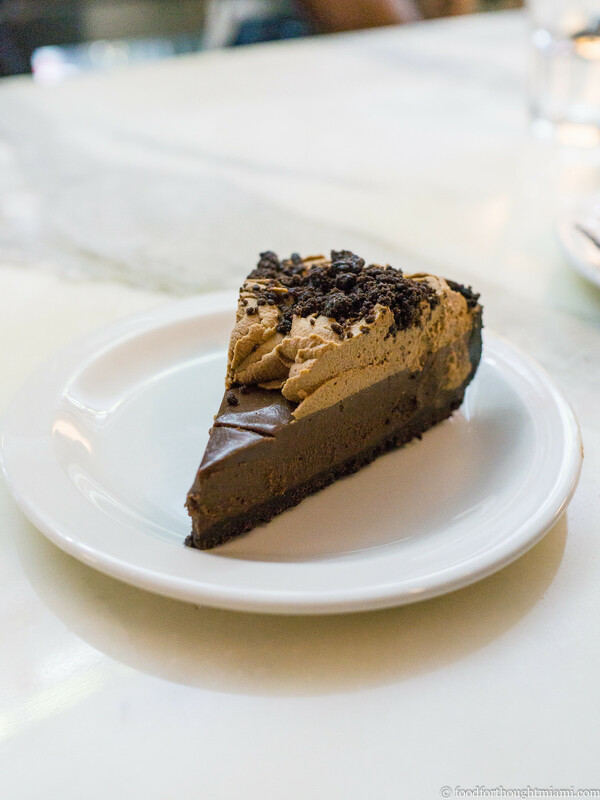 Also pretty great: her chocolate pie with a brown butter Oreo crust, which surprises with a refreshingly dark, bitter undercurrent of coffee to balance out the sweetness. 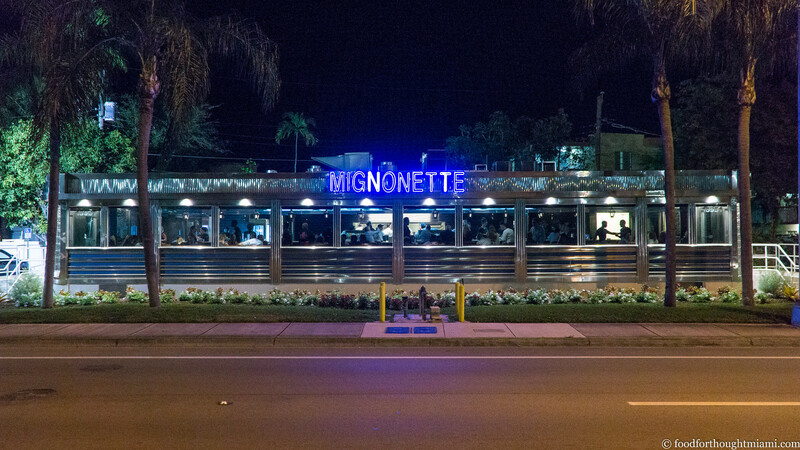 Mignonette Uptown officially opened on Friday for lunch and dinner service. So I'm now in the happy position of having a Mignonette within ten miles of home in either direction. I don't normally do such things, but – full disclosure – Danny and Ryan are indeed friends. Plus, Frod Jr. is a former employee, having spent summer before last busing tables at Mignonette downtown. I meant to get the "Oysters Ciancio," done with melted beef tallow, garlic and shallot, but our order got mixed up. Given that this was a F&F dinner, the night before the restaurant officially opened, it's much too early to talk about service. 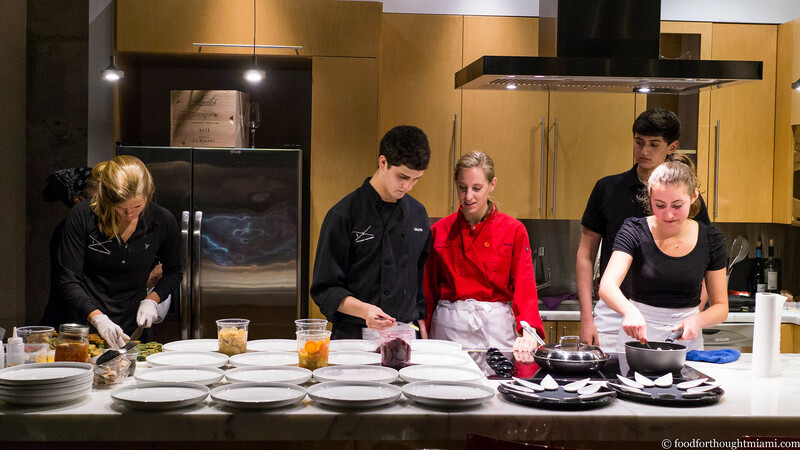 But all the staff had the right attitude and eagerness, and frankly I was floored that the kitchen was cooking the entire menu for a friends and family night. It was a trial by fire, and from where I was sitting, everyone passed. 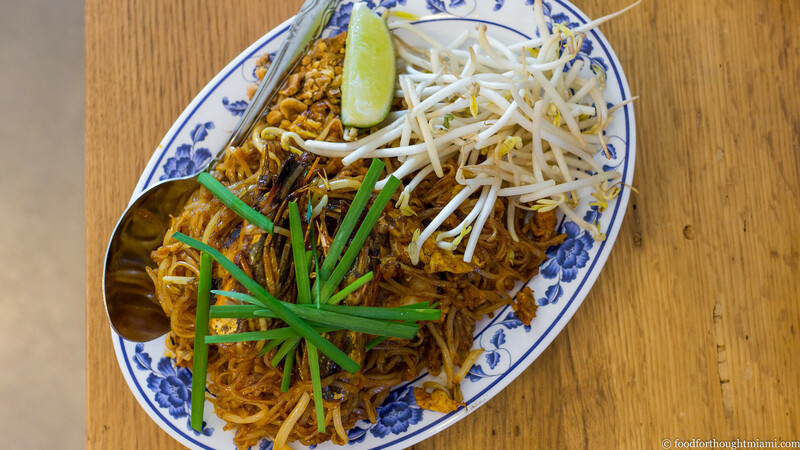 About a year and a half ago, I sung the praises of Cake Thai Kitchen, a tiny spot in Miami's Upper East Side opened by chef Phuket Thongsodchareondee (a/k/a "Cake"). From this little hole in a wall, Cake was putting out some of the best Thai food I've eaten in this city. This was not the "regulation issue" menu of so many other local Thai spots; Cake offered some boldly-flavored street foods, executed with that percussive attack of spicy / sour / salty / bitter / sweet / herbaceous that brings such joy when Thai food is properly done. The only thing I couldn't unreservedly recommend about Cake was its location. It was actually great for me personally, a few miles from home and literally just a one-block detour from my usual commute. 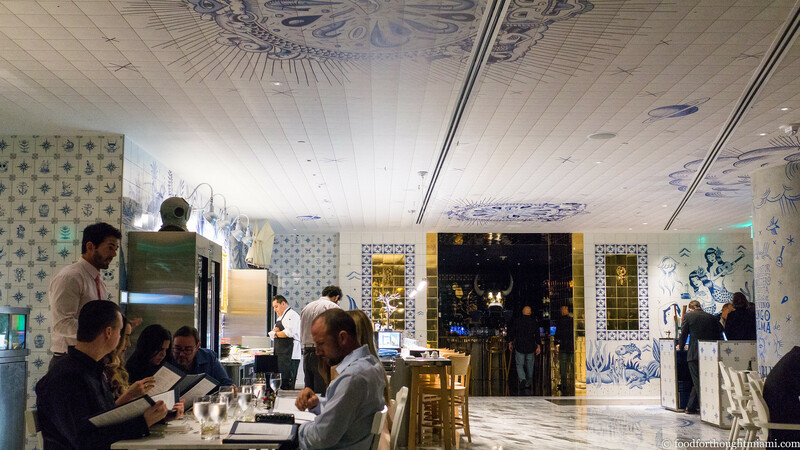 But despite some new upmarket neighbors – Paulie Gee's on the next block, The Anderson around the corner – this particular stretch of Biscayne Boulevard remains somewhat dodgy, and the utilitarian-at-best venue might not be everyone's idea of a night out on the town. If I wasn't solo, it was usually a take-out option for me too. Well, now you can have your Cake and eat there too. [Go ahead, just kill me now]. 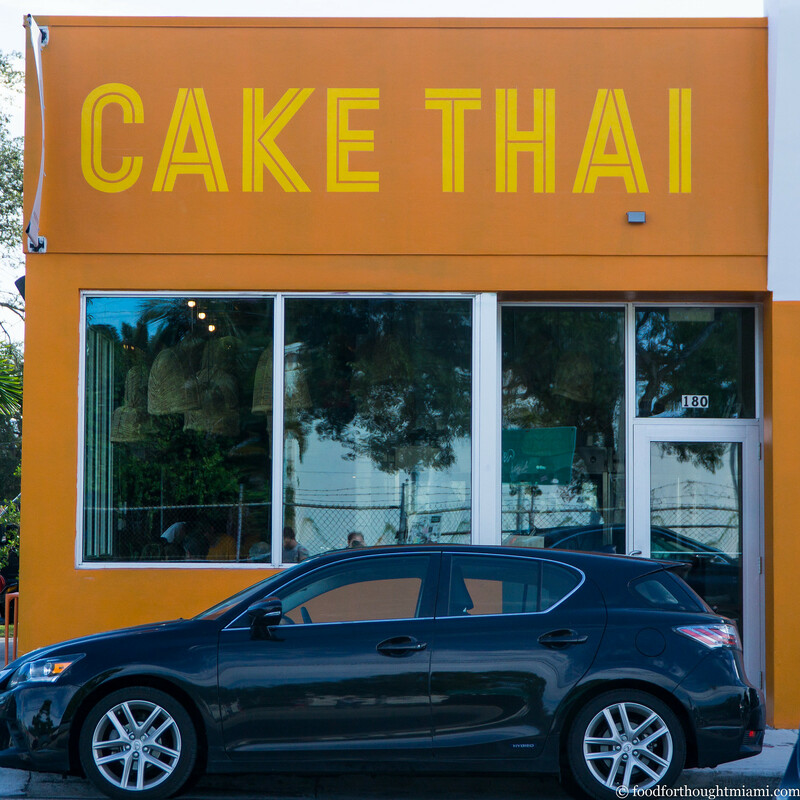 A second Cake Thai has opened in trendy Wynwood, just off the "gateway" corner of 29th Street and NW 2nd Avenue. I made my way over there for lunch just before the new year (see all my pictures in this Cake Thai - Wynwood flickr set). 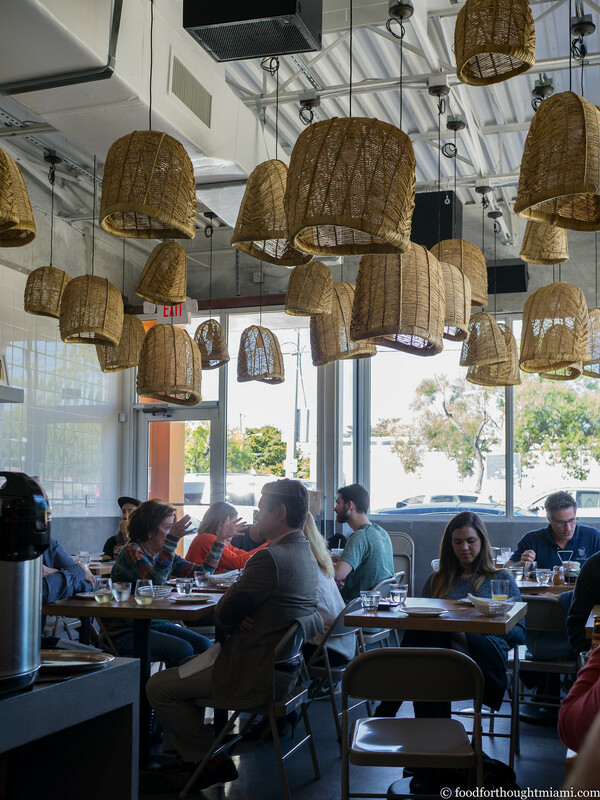 It won't be mistaken for the Four Seasons, but the dining room, with seating for about 30, is bright and airy, the walls covered with white tiles, the ceiling festooned with upside-down woven baskets for decoration. 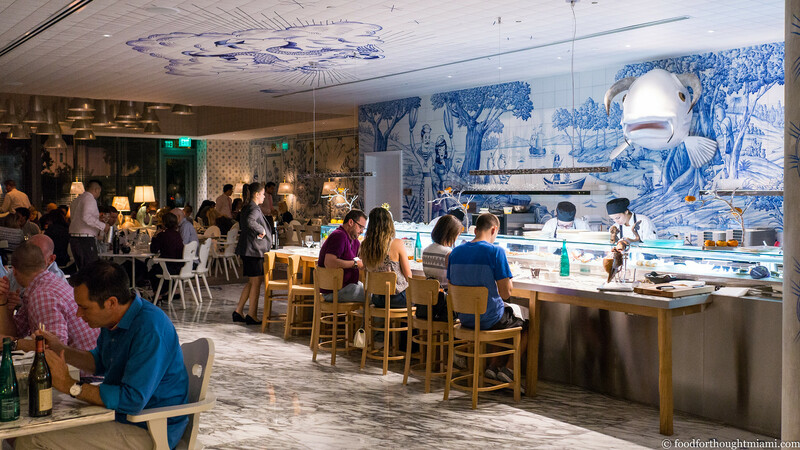 The opening menu at Cake Wynwood is abbreviated in comparison to the original location: about thirty dishes, roughly half as many as on the Biscayne Boulevard menu. It's something of a "greatest hits," but also includes some items that were semi-regular blackboard specials at the mothership (the chive cake with chili vinegar and dark soy sauce, the chicken in red curry with pickled bamboo shoots). There's also at least a few things that are completely new, at least to me: a duck larb, some new soups and large format dishes. 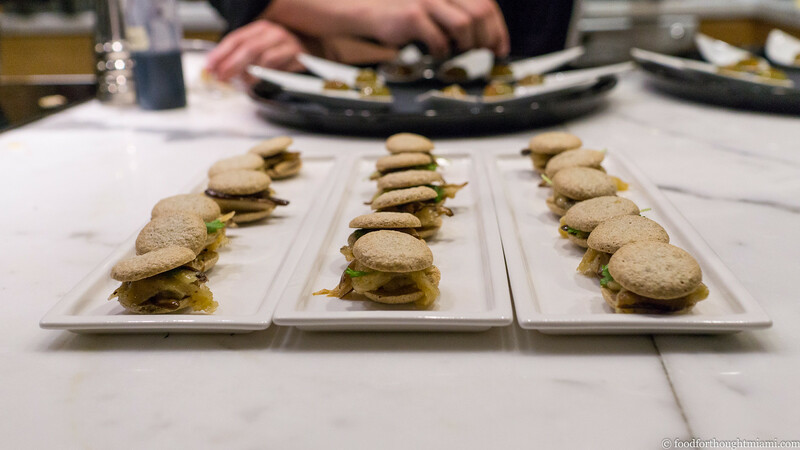 The new kitchen gives Chef Cake a little more room to play, and so we can expect some more in-house pantry items to be making their way onto the menu. 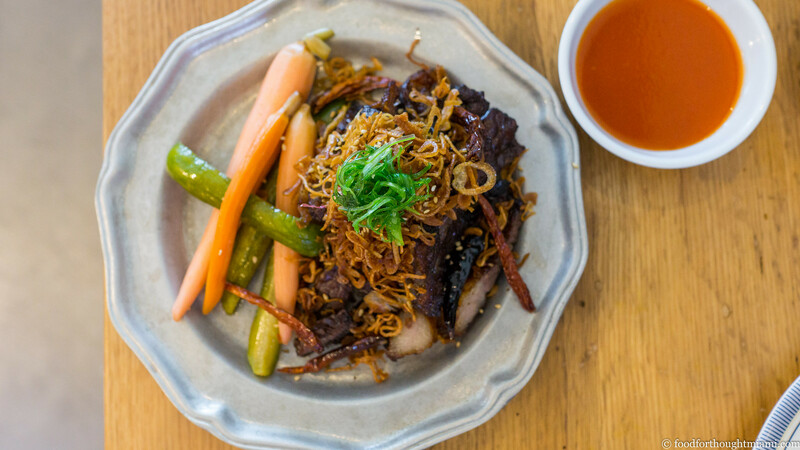 His nuea dad deaw – dried and fried beef jerky, made here with rich, fatty brisket buried under an avalanche of crispy fried shallots – is served with house-made sriracha sauce and pickles. I never order pad thai. I'll invariably pick at it if the kids order it, and invariably be disappointed. Until I tried Cake's, which brings the proper balance of sour and spicy and funky to a dish that is usually just insipidly sweet. Some plump, fresh head-on shrimp also help elevate the dish. Fresh bean sprouts add crunch.